Austin O’Brien wears black high top Converse “Chuck Taylor” All Stars in the film. 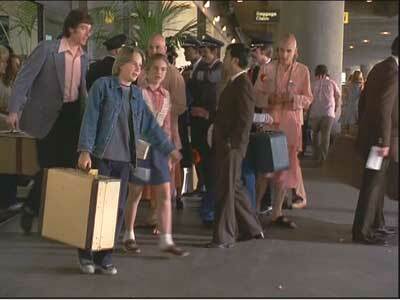 Nick picks up Vada at Los Angeles Interntational Airport. 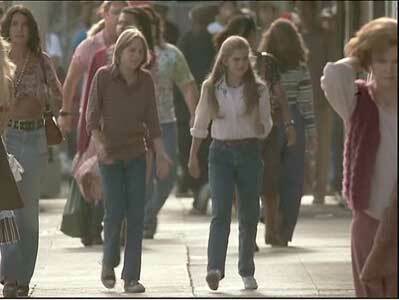 The sequel to My Girl continues Vada Sultenfuss’ (Anna Chlumsky) search for meaning in her life. 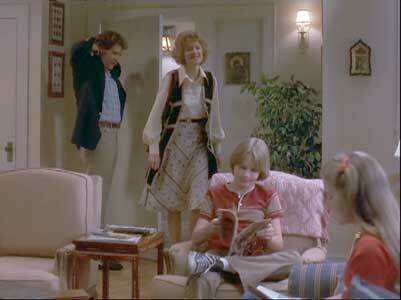 Since the first film, her dad Harry (Dan Aykroyd) and Shelley (Jamie Lee Curtis) have married. Their new family dynamic is about to change again, as Shelley is now in the eighth month of pregnancy, and soon Vada will have a baby brother or sister. The subject of maternity makes Vada curious about her own mother, Maggie Muldovan, who died two days after giving birth to Vada. All Vada knows about her is that she was a would-be actress in Los Angeles and all that she has of her mother’s things are a few playbills and small items kept in a small box in her room. When asked to complete a research project at school, Vada decides to do what she can to find out about her mom. Conspiring with Shelley, Vada spends much of her savings to purchase an airline ticket to Los Angeles over spring break at school. Harry is very much opposed to Vada traveling on her own, but since his brother Phil (Richard Masur) is now living there, he relents and allows her to go and stay with Phil, who runs an auto repair shop. Nick and Vada pore over her mom’s high school yearbook at an outdoor cafe. Upon her arrival at LAX, Vada is met at gate not by Phil, but by Nick (Austin O’Brien) the teenaged son of Phil’s live-in girl friend Rose Zsigmond (Christine Ebersole). At first Nick and Vada don’t hit it off, partly due to their differences in life styles and attitude about things. Their situation was not helped when Vada accidentally sees Phil paying Nick to take her around town. Nevertheless, the two set out looking for information about Maggie. They are able to find a copy of Maggie’s high school yearbook, and through photographs and written descriptions track down and interview some of her friends and classmates. The relationship between Vada and Nick is still tenuous, and things come to a boil when Nick grabs Vada’s ring (her only memento of her friend Thomas J. from the first film) and it appears that he has allowed it to fall it into the La Brea tar pits due to carelessness. But things are resolved between the two, and after they start to trust each other, their relationship starts to develop in a postive manner. They even conspire to sneak out of the house and visit the walk of fame on Hollywood Boulevard. Evenutally the most important person they discover is Maggie’s first husband, Jeffrey (John David Souther), who Vada didn’t even know existed. The remainder of the film is about what Vada discovers about her mom when she visits Jeffrey, her own roots, and how this changes her perception of herself and her family. Two important subplots have to do with relationships -- that of Phil and Rose, who are living together but don’t seem to have made a serious commitment to each other and the growing romance between Nick and Vada. Nick and Vada walk through the streets of Los Angeles to find people who knew her mom. Clearly the success of the original My Girl was the reason that this sequel was made, but how much tragedy and self-discovery does a normal adolescent need to experience? While this theme was touched upon in the storyline, and there is one scene where you think history might repeat itself, screenwriter Janet Kovalcik was smart to take My Girl 2 in a different direction. The search for one’s roots is a universal theme that deserves exploration, and the discovery that goes with it can be emotional without being melodramatic. So even though My Girl 2 is set in the big city, it still has that small town charm, with a cast of nice, friendly people that made the original film so engaging. Anna Chlumsky, gives her character sweetness with resolve, a bright kind of naivete that wears well through this film as it did in the first. Her personality weathers the emotional ups and downs of the story-line very well. Austin O’Brien starts out by being the street-smart city kid who sees life from a cynical point of view, but as his character interacts with Chlumsky’s, you begin to see a vulnerable and emotional side that pairs well with hers. The adult characters are mostly reduced to cameos in this film, but all seem believeable. Angeline Ball’s brief appearance as Maggie (in a home movie) is the best adult performance. The only relationship that needed more development was the relationship between Phil and Nick’s mother. Much of their subplot was devoted to a customer, Dr. Sam Helburn (Gerrit Graham) who kept bringing in his car for servicing and trying to date Rose. Yet Phil and Rose were already living and working together, and acting like a married couple, so much of this didn’t make sense. Nevertheless, if you liked My Girl, you will like its sequel. Nick and Vada pretend to be settled in for the night when Phil and Nick’s mom go out for the evening. Nick finds the star for Judy Garland on Hollywood Boulevard. Austin O’Brien wears black high top chucks throughout the film and they go well with his character type, the brash street-smart kid of the seventies. There aren’t a lot of closeups, but you see chucks framed in most of the scenes he appears in. Probably the best sequence is during Vada and Nick’s night out on the town, when they are looking for Judy Garland’s star on the walk of fame in Hollywood. Vada places her hands in Judy Garland’s hand prints. My Girl 2. (1994) Anna Chlumsky, Dan Aykroyd, Jamie Lee Curtis, Austin O’Brien, Richard Masur. Directed by Howard Zieff. Categories: Drama, Teenagers, Coming of Age.